Hula Hoop Girl is a real-life account of finding the center of our busy lives. How does a woman avoid over-load and burn-out? Do you know what you were “called” to do, and how to avoid distractions? 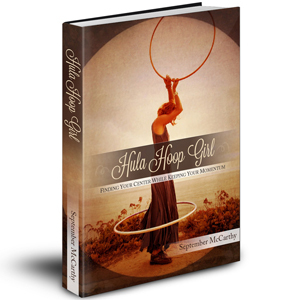 Hula Hoop Girl is packed full of questions, real-life accounts, and links to other people that have lived this story. Join this author as she lives out a real-life story of finding her center, while keeping her momentum. Hula Hoop Girl is an oasis of encouragement for the overworked, overwrought, overcommitted woman who is just trying to figure out who she really is. This book is a short volume - easy to read within an hour. But I envision it being used in small groups, over a series of weeks, at MOPS groups or even during playdates, while all the kiddos are corralled at the playground. Hula Hoop Girl encourages women to “find your center while keeping your momentum.” And it’s written from a woman who has lived these words. She’s a homeschooling mother of 10 children, and she has been active in her church and community. Yet she’s found balance, while collecting bits of wisdom for the rest of us along the way. I read this book at a time when I’m trying to figure out whether I can say “yes” to one more thing. Her book has me reevaluating how many hula hoops I’m spinning right now, and asking: “Should I add another?” She advises, “You don’t always have to say `yes.’ And a no doesn’t have to come with a list of reasons.” Yes… I needed to hear those words. Thank you, September, for encouraging people on your blog, and now in this e-book. It’s an accessible resource for busy women in need of a burst of encouragement. “As a passionate, extroverted, type-A personality, I often end up with too much on my plate. I need wiser, older women to speak wisdom and perspective into my chaos. But sometimes the input I receive feels more like condemnation of who God made me to be. That’s the difference with September’s book-she brings insight and encouragement without the condemnation. She gently exposes us to God’s perspective on our worth, and then shows us how that truth can guide where we invest ourselves. After reading, I was inspired and hopeful that I could indeed find my balance AND fulfill all God has called me to.